With over 20 years of experience in timber manufacturing and off-grid technology, Dunster House Ltd has designed and developed many potential solutions for humanitarian aid. The company is now an Oxfam supplier and is playing a key part in the Pee Power Project. They will be exhibiting at AidEx 2018 on stand C37. Around the world, almost two and a half billion people lack access to basic sanitation, like toilets and latrines. Lack of sanitation is a primary cause for water pollution – more than 80% of human wastewater is discharged into rivers and oceans without any treatment, meaning that 1.8 billion people worldwide drink from contaminated sources. Waterborne diseases are carried into the contaminated water, causing thousands of deaths every day. Although the cause of death may be preventable, it can’t be defeated without proper sanitation. The devastating effects of inadequate sanitation are not to be underestimated. As well as the impact on public health, poor sanitation also has far-reaching societal impacts, particularly for women and girls. A third of women worldwide have nowhere safe to go to the toilet. They often have to practice open defecation. Meaning they risk shame, harassment and even sexual assault every day. When combined with the taboos surrounding menstruation, this lack of privacy is actually preventing girls from completing their education. Thus, many girls drop out of school or stop attending classes when they reach puberty. Due to not having separate, lockable toilets or adequate washing facilities. Essential elements of life, such as clean water and adequate sanitation are not accessible by underdeveloped minorities. There are, however, enough resources for everyone in the world. Unfortunately, bad economics or poor infrastructure have deemed these luxuries they cannot afford. With that in mind, we at Dunster House took it upon ourselves to contribute towards the better future of those affected by a lack of sanitation. This is achieved by our participation in working towards the sixth Sustainable Development Goal of access to water and sanitation for all by 2030. Through collaboration with UNICEF, Oxfam and Medair, Dunster House has been able to provide emergency sanitation solutions in various countries. For instance Chad, Nigeria, South Sudan and the Central African Republic. Dunster House began in 1994 as a small, family-owned business supplying PVC windows and doors to homes across the UK, later expanding into the field of timber garden buildings and timber play systems. After years of hard work, we successfully opened the Humanitarian Department, a subsection dedicated solely to finding solutions that promote Global Goals, such as providing proper sanitation. Our aim is to supply a varied range of WaSH (Water, Sanitation and Health) products to those affected by natural disasters or conflict, as part of emergency relief efforts. So far, we have sent raised latrines, latrine superstructures and our new Dunster Slab squatting plate to communities in need. This demonstrates how, with the right will, even a family business can make a global impact. Today, the company continues to expand its range of Humanitarian products. Using our expertise, resources and knowledge of design and manufacturing, Dunster House has become one of the leading manufacturers of sanitation equipment for national and international charities. 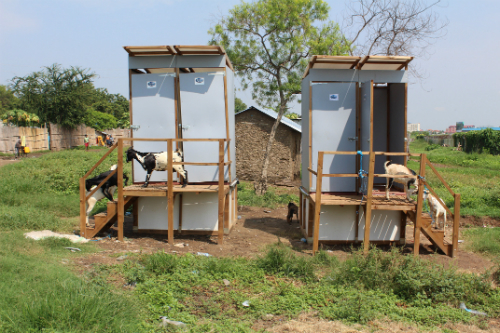 Their innovative and affordable sanitation solutions may save millions of lives every day. Excellent initiative, so many wonderful things can be done with a basic material such as wood. As far as humanitarian efforts go, the primary objective should always be to provide people with a roof over their heads and adequate sanitation to avoid diseases and ill-health. Well done!